Many people are surprised to learn that bauxite is not a mineral. It is a rock composed mainly of aluminum-bearing minerals. It forms when laterite soils are severely leached of silica and other soluble materials in a wet tropical or subtropical climate. Diagnostic Properties Soft, low specific gravity, color. Often exhibits pisolitic habit. Uses The primary ore of aluminum. Synthetic bauxite is used as an abrasive and as a fracking proppant. Bauxite does not have a specific composition. It is a mixture of hydrous aluminum oxides, aluminum hydroxides, clay minerals, and insoluble materials such as quartz, hematite, magnetite, siderite, and goethite. The aluminum minerals in bauxite can include: gibbsite Al(OH)3, boehmite AlO(OH), and, diaspore, AlO(OH). Bauxite is typically a soft material with a hardness of only 1 to 3 on the Mohs scale. 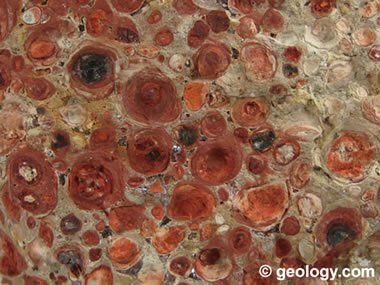 It is white to gray to reddish brown with a pisolitic structure, earthy luster and a low specific gravity of between 2.0 and 2.5. These properties are useful for identifying bauxite; however, they have nothing to do with bauxite's value or usefulness. This is because bauxite is almost always processed into another material with physical properties that are distinctly different from bauxite. 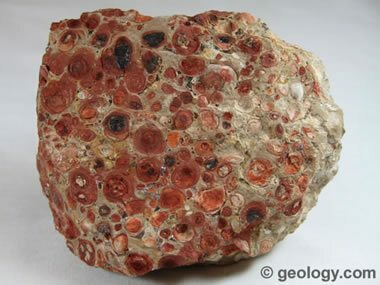 Pisolites in bauxite: Close-up view of the bauxite specimen in the photo at top of page. This photo shows detail of the pisolites. Bauxite is the principal ore of aluminum. The first step in producing aluminum is to crush the bauxite and purify it using the Bayer Process. In the Bayer Process, the bauxite is washed in a hot solution of sodium hydroxide, which leaches aluminum from the bauxite. The aluminum is precipitated out of solution in the form of aluminum hydroxide, Al(OH)3. The aluminum hydroxide is then calcined to form alumina, Al2O3. Aluminum is smelted from the alumina using the Hall-Heroult Process. In the Hall-Heroult Process, the alumina is dissolved in a molten bath of cryolite (Na3AlF6). Molten aluminum is removed from the solution by electrolysis. This process uses an enormous amount of electricity. Aluminum is usually produced where electricity costs are very low. Much of the aluminum used in the United States is produced in Canada using hydroelectric power. Bauxite without pisolites: Bauxite from Demerara, Guyana. 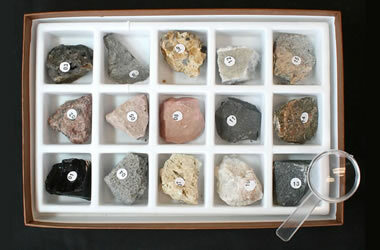 Some specimens of bauxite do not have the pisolitic structures. Specimen is approximately 4 inches (10 centimeters) across. Calcined alumina is a synthetic corundum, which is a very hard material (9 on the Mohs Hardness Scale). Calcined alumina is crushed, separated by size, and used as an abrasive. Aluminum oxide sandpaper, polishing powders, and polishing suspensions are made from calcined alumina. Sintered bauxite is often used as a sand-blasting abrasive. It is produced by crushing bauxite to a powder and then fusing it into spherical beads at a very high temperature. These beads are very hard and very durable. The beads are then sorted by size for use in different types of sandblasting equipment and for different sandblasting applications. Their round shape reduces wear on the delivery equipment. Sintered bauxite is also used as an oil field proppant. In drilling for oil and natural gas, the reservoir rock is often fractured by pumping fluids into the well under very high pressures. The pressure builds up to very high levels that cause the shale reservoir rock to fracture. When fracturing occurs, water and suspended particles known as "proppants" rush into the fractures and push them open. When the pumps are turned off, the fractures close, trapping the proppant particles in the reservoir. If an adequate number of crush-resistant particles remain in the reservoir, the fractures will be "propped" open, allowing for a flow of oil or natural gas out of the rocks and into the well. This process is known as hydraulic fracturing. Powdered bauxite can be fused into tiny beads at very high temperatures. These beads have a very high crush resistance, and that makes them suitable as a proppant. They can be produced in almost any size and in a range of specific gravity. The specific gravity of the beads and their size can be matched to the viscosity of the hydraulic fracturing fluid and to the size of fractures that are expected to develop in the rock. Manufactured proppants provide a wide selection of grain size and specific gravity compared to a natural proppant known as frac sand. World bauxite resources are adequate for decades of production at current rates. Other materials could be used instead of bauxite for alumina production. Clay minerals, alunite, anorthosite, power plant ash, and oil shale could be used to produce alumina but at higher costs, using different processes. Silicon carbide and synthetic corundum are sometimes used in place of bauxite-based abrasives. 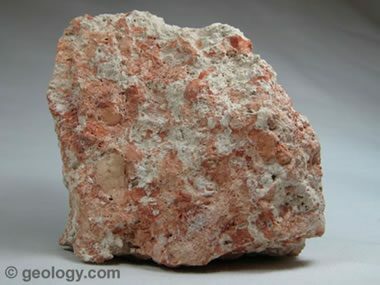 Synthetic mullite and magnesium oxide made from magnesite are sometimes used in place of bauxite-based refractories. Countries producing over 5 million metric tons in 2017. Data from the USGS Mineral Commodity Summary. Bauxite is found in abundance at many locations around the world. In 2017 the ten leading bauxite producing countries were: Australia, China, Brazil, India, Guinea, Jamaica, Russia, and Kazakhstan. Each of these countries has enough reserves for many years of continued production. Some have reserves for over 100 years of production. The United States has small amounts of bauxite in Arkansas, Alabama, and Georgia; however, there is very little mining of bauxite in the United States, and at least 99% of consumption is imported.